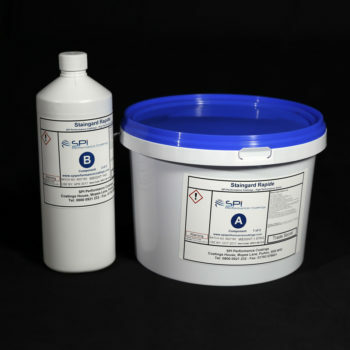 Staingard Rapide is a 2-component, polyaspartic polymer specially formulated for sealing concrete (and other) surfaces prior to the application of sprayed polyurea protective coatings and tanking membranes and sealing the surfaces of resin bonded anti-slip treatments to improve durability and ease of cleaning. The product is solvent-free (“Ultra-Low VOC”), light-stable with good low-temperature cure and moisture tolerance, making installation far less sensitive to ambient conditions. The rapid cure enables over-coating with sprayed polyurea to take place with minimal delay, and similarly trafficking of anti-slip treatment treatment with minimal delay. Ensure that the Staingard Rapide Safety Data Sheets and Method Statement have been read before using this product. The instructions below are a guide only and not meant to be comprehensive installation instructions. With the A-component tub placed on a flat, stable surface, remove the lid. Similarly remove the lid of the B-component jar and add the contents to the A-component. Mix immediately using the drill and paddle for 15 seconds only. [Do not allow the opened or mixed components to stand unnecessarily]. Pour the mixed material onto the work area and spread using the roller or squeegee for priming, or only the roller if sealing an aggregate surface.